Chicago's Latest Case Of Political Graft Has A Twist : The Two-Way A jury must decide whether Democratic State Rep. Derrick Smith abused his office and took a $7,000 bribe or was entrapped by an overzealous FBI. Illinois Rep. Derrick Smith, D-Chicago, at the state Capitol in Springfield last month. A jury is deliberating a verdict in Smith's trial on bribery charges. It's the kind of political corruption allegation that makes even hardened Chicagoans roll their eyes and exhale a heavy sigh that says, "here we go again." A state representative is caught on tape secretly meeting with a shady character, pocketing an envelope full of cash. The politician in question laughingly refers to the $7,000 alleged bribe as "cheddar," as he talks about being paid off in a way that won't come back on him. Just another day of greedy graft in a state that's put two former governors from both parties behind bars for corruption in the span of less than a decade? As a Chicago jury deliberates the fate of Chicago Democratic State Rep. Derrick Smith on federal bribery and extortion charges, this time around it might not be as clear cut as it first appeared. Defense attorneys and some legal observers have raised questions about the FBI's tactics and whether Smith was pushed so hard into taking the bribe that it amounted to entrapped. Federal prosecutor Marsha McLellan, in her closing argument today, told jurors that Smith, 50, "took advantage of his office to put cash in his pockets." The government alleges he took the bribe from a felon-turned-government-informant identified in court only as "Pete." In exchange, Smith was to write a letter of recommendation on behalf of a day care center operator in his district who was seeking a state grant. The day care facility was real but the $50,000 grant wasn't. It was concocted by the feds after the informant, who has a long criminal record and had been a low-level but trusted aide working on Smith's campaign, claimed he could convince the then-freshman state representative to take a bribe. The undercover recordings show Smith was extremely reluctant at first to take cash from the informant, and that he resisted and rebuffed "Pete's" attempts to bribe him several times. According to The Chicago Tribune, "Smith's attorneys have sought to paint the lawmaker as the victim of overzealous agents who had a shady informant hound him about taking the bribe until he finally succumbed." In defense lawyer Victor Henderson's closing arguments, he told the jury that Smith was "set up" by the informant, who was paid thousands of dollars by the federal government. "There was no crime here, ladies and gentlemen, and to the extent there was anything that looked like one, it was fabricated and it was a ruse," said Henderson. Some veteran observers of political corruption agree there may be something to that defense. Chicago Tribune columnist Eric Zorn provides this reality check: "Really? With all the venal, ethically greasy pols and bureaucrats slithering through our state and local halls of power, the feds chose to target this mope? A freshman legislator, one of the smaller fish in the murky pond that is Illinois politics, who had to be badgered relentlessly until allegedly accepting a bribe?" The jury began deliberating late Monday afternoon and went home for the night after two hours without reaching a verdict. They'll return for deliberations Tuesday morning. 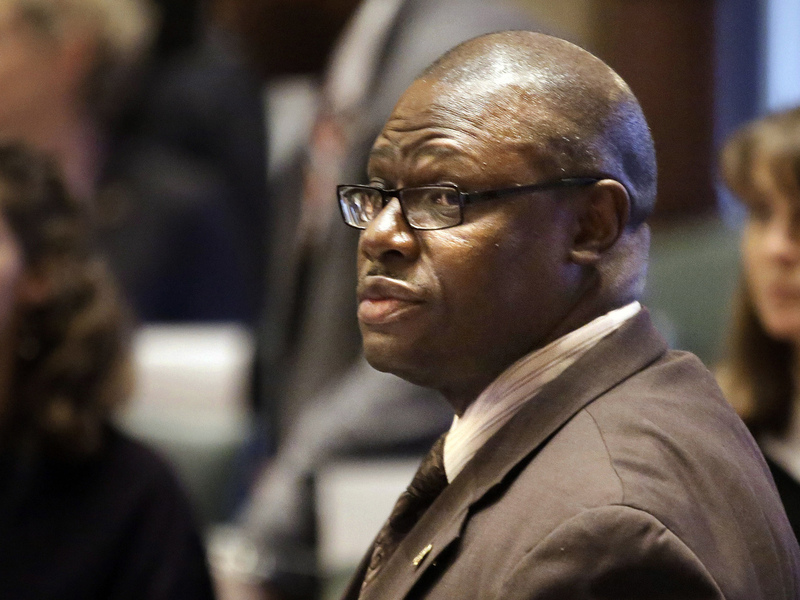 Whether he's convicted or not, Smith's days in the Illinois General Assembly are numbered, as he was defeated in the Democratic primary in March.